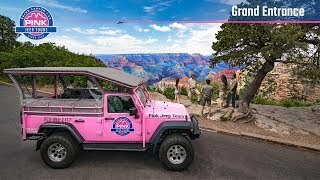 Tour the Grand Canyon in our custom Pink® Jeep®. Your tour guide knows just where to take you for an introduction to this national landmark. See the gorgeous views along the rim on your journey to scenic view points. Your guide is a wealth of knowledge about all aspects of the canyon, from geology and botany to infamous myths and legends. Challenge them with questions to learn much more than you ever could from brochures. Stop at Grandview Point to see an area that was once mined for copper. Grandview was the first area to welcome visitors in the late 1800's and even had a luxury hotel. Your guide can shed more light on the history of this tranquil, tree-lined locale. Our guides have unique insights and experiences that help them access each viewpoint at the perfect time. Your tour features two other stops along the south rim, which can vary depending on conditions. Your tour of the Grand Canyon includes park admission fees and tickets to see the IMAX movie: Grand Canyon: Hidden Secrets. This timeless film shares captivating history lessons on a six-story screen, complete with in-depth looks at the area’s native tribes, explorers and places that few have seen. IMAX Movie is viewed either before or after your Jeep tour, your choice. Show times are hourly at half-past the hour. Grand Canyon National Park re-entry requires the purchase of a park pass. THE MOST INFORMATION AVAILABLE WITH AN OUTSTANDING GUIDE. HE WAS VERY GOOD AT HIS JOB. JASON PROVIDED MORE INFORAMTION ABOUT THE CANYON THAN WE WOULD HAVE EVER GATHERED ON OUR OWN AND HE COOPERATED WITH OUR NEEDS AND HIS KNOWLEDGE OF THE AREA WAS OUTSTANDING. I think that I answered this before, but we loved that the Jeep met us at the El Tovar. The Jeep was late, which made us a little anxious, which is why I rated this one part lower. Everything else was great. I am very happy that we decided to do this tour! Frank was so knowledgeable! We covered a lot in our 2 hour time frame!! Sam did a wonderful job! Tour was very informative. Great guide!